With college application season under way for millions of U.S. high school students, USC researchers on Oct. 29 launched a free Facebook game to help underserved students, often the first in their families to aspire to college, navigate the complicated process of applying for college and financial aid. 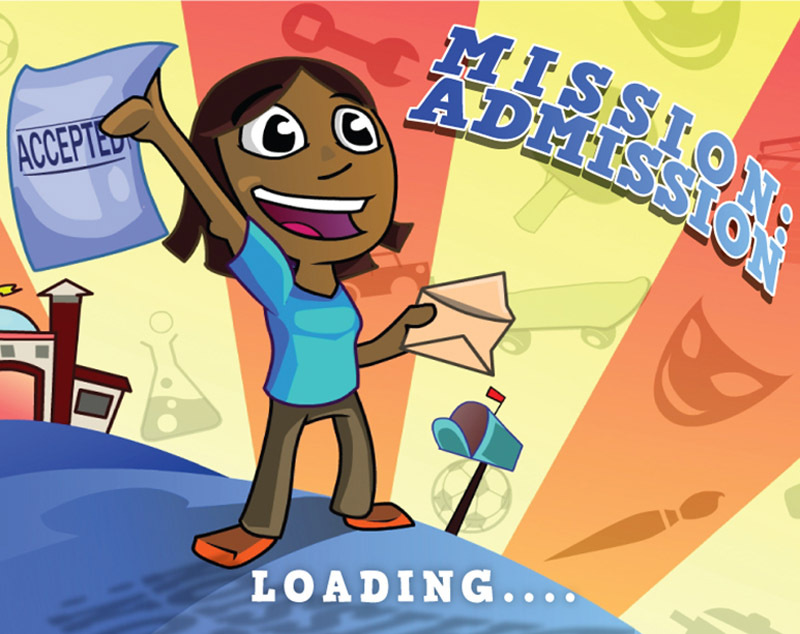 Created under the umbrella of the Collegeology Games project, Mission: Admission allows students to virtually experience the demands of the college application process and empowers them with the skills and knowledge they need to apply, get into and pay for college. The project is a collaboration of the Pullias Center for Higher Education, based at the USC Rossier School of Education, and the Game Innovation Lab at the USC School of Cinematic Arts. In the game, students guide their avatars through the process of meeting with college advisers, choosing the types of schools to apply to (including four-year, community and technical colleges), scheduling community service and sports activities, applying for scholarships and financial aid, and requesting recommendation letters. Throughout the United States, school budget cuts have meant students are often left to navigate the college application process alone. The average ratio of students to college counselors in public high schools stands at 459 to 1 (California has a ratio of more than 800 students per college counselor). And a recent survey of social media habits by high schoolers showed that nearly three-quarters of the students log in to Facebook at least once a day. That makes the social networking site a prime destination for Mission: Admission, said Tracy Fullerton, holder of the Electronic Arts Endowed Chair and director of the Game Innovation Lab. Teacher Leslie Aaronson, who participated in a pilot of the game with her 12th-grade class at Foshay Tech Academy in Los Angeles, said many of her students, excited about the prospect of their avatar being accepted to college, continue to play Mission: Admission at home or during free time at school. Last year, the first entry in the Collegeology Games series — a card game called Application Crunch — was introduced. USC gave away 1,000 free copies of the game to college counselors in high-need schools across the country before making it available online in January. Collegeology Games plans to launch additional games on multiple media platforms designed to help students prepare for college and apply for financial aid. Two new games are in the works for next spring: FutureBound, which targets middle school students, and a financial aid game. The Collegeology Games Project was funded by the USC Office of the Provost, The Rosalinde and Arthur Gilbert Foundation, the U.S. Department of Education’s Institute of Education Sciences and the Bill & Melinda Gates Foundation.